Our Grand Rapids motor rewinding technicians know that rewinding an electric motor requires great precision and a skilled hand by those with specialized experience in mechanical or electrical repair. A poor rewind job will result in a motor that doesn’t work properly, or not at all, so it is important to trust trained and experienced winders who specialize in this unique service. The winders at Fixall Electric Motor Service have decades of experience working with all types of motors, ensuring that your electric motor rewind will be done correctly and function at a high level for a long time. When an electric motor fails or burns out, rewinding is a quick alternative to motor replacement. Rewinding can usually be completed quickly, minimizing lost production time. Our electric motor winders can easily determine if your motor can be successfully rewound — depending on how much damage exists — and let you know if rewinding or replacement is your best option. 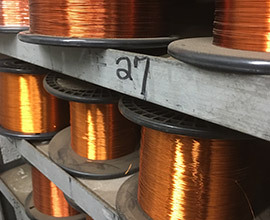 For more information about electric motor winding and rewinding from the expert winders at Fixall Electric Motor Service, please call the shop at 616.454.6863.